Today: How to change up your oatmeal game. I think that you should put cheese on your oatmeal, and then eat it for lunch. Salt and pepper, too. Maybe some hot sauce. Yes, this sounds crazy. Yes, this sounds revolutionary. Yes, this sounds like something that people will give you weird looks for, like if you brought pungent Indian food into your cubicle, or a drippy, messy burrito. But you should do it anyway, because it is not nearly as weird or boundary-pushing as it seems. Risotto, polenta, and grits all get the savory treatment; why should oats always be syruped and dried-cranberried? Why not put more salt, more cheese, and more spice onto that steaming bowl of front of you -- one that reheated beautifully in the microwave, mind you -- and feel daring, original? All the more reason to have that pastry for breakfast. What breakfast foods do you like to eat for lunch? Let us know in the comments! even if you eat it for breakfast you can zap it up. I like cinnamon, cayenne and pepper on mine...with honey of course! oatmeal lam showder~~ wohoooooooo..i luv it!!! I made something similar to this on my blog. I called it "risoatmeal." Oh so good, savory brunch oatmeal with cracked pepper, garlic, some shaved parmesan & a healthy drizzle of quality olive oil. I've done some crazy things with my oatmeal - added a fried egg, mixed in spinach and egg whites, I even added some hot sauce on some really poor college days. I prefer savory to sweet oatmeal any day! savory waffles! mix some herbs into the batter and top with whatever you please! I learned from my mom that my favorite way to eat cream of wheat is with (good!) butter, a wee bit of salt, and some parmesan on top. One of my most favorite savory ways to start my day. 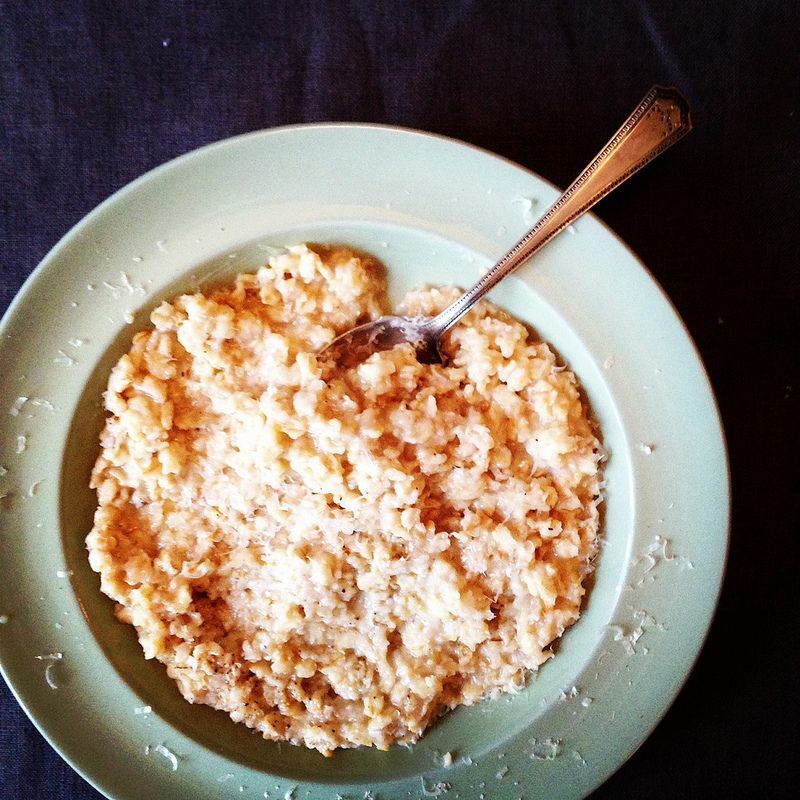 I'm a huge fan of steel cut oatmeal with caramelized onions and a dollop of ricotta. A tiny sprinkle of red chili flakes for a little heat is nice too. I usually add miso and tahini to my morning porridge. My partner eats oatmeal with garlic and soy sauce and olive oil all the time. My mom made it with butter, salt & pepper, and brewer's yeast. Everyone's thought I'm crazy my whole life for eating it this way. Great ideas here! Making all kinds of lunch plans now. I eat eggs for dinner all the time in all different ways but this is different and oatmeal is such a nice, portable lunch. Crumbled bacon, cheese and an egg over easy! I can't agree more! I cook savory oatmeal all the time, this being my all-time favorite! Mix all but the pumpkin and parmesan for about 2.5 minutes in the microwave. When it's to a consistency you like, mix in the pumpkin and parmesan. Great question. One thought... ground oatmeal can work in lieu of bread crumbs but it helps to process them first in a blender or coffee grinder to get a smaller crumb like a bread crumb. I can imagine using it, cooked (microwave fine) and pureed with a stick-blender, to thicken a sauce that has a lot of acid and needs a little thickening and sweetness. Timely post! This past weekend I did savory cheddar oatmeal with a poached egg, avocado, jalapeno, and scallions. @AAFoodie, I made mine with a 2:1 ratio of milk to oats. People are more receptive to it when you tell them it's "wheat polenta" than saying savory oatmeal. Yum, can't wait to try this, thanks!